As a pet owner I like to make sure our girl Java is comfortable at night in her kennel. She's still a puppy and super curious so we aren't quite ready to let her be on her own all night in the house. She just seems to get into things when she shouldn't when we aren't around - probably out of boredom. 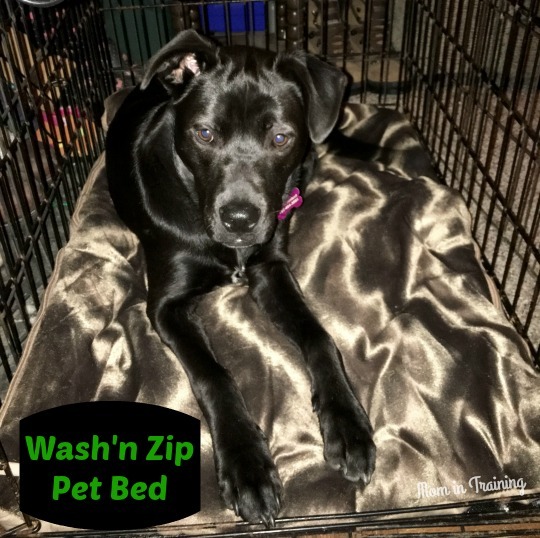 Recently I had the opportunity to check out a Wash'n Zip Pet Bed for her. I have to admit I was quite tempted to keep the darn thing for myself as a blanket it was so soft and fuzzy. But I'm a good pet mamma so I did the right thing and slipped it into Java's kennel. And boy was I glad I did when I saw her look at me once she stretched out and laid down on it. I could just tell she was just as in love with it as I was. Of course from the pet owner side of it I was really excited about this particular pet bed because it's not just something that sits in her kennel collecting pet hair and all that kind of stuff like other beds. It's one I can take out, unzip and wash it with ease. Once unzipped it's like a big blanket so you can toss it in the washer and dryer with no problems. I try to do this every time Java gets a bath so it's clean and fresh just like her. Since we've gotten the bed we've washed it three times with no problems, and to be honest it looks just as good as the day it arrived. Another great part about the bed is when it's unfolded in blanket form you can also use it to cover furniture or the back seat of your car for added protection. I love that it's more than just a standard pet bed and that it's made so well it withstands our big girl walking all over it every day in her kennel. In developing and designing our Wash‘n Zip Pet Bed, we elected to focus on quality in order to provide our customers with a reliable, sturdy product that is built to last. Because it features rugged materials, quality stitching, and a heavy duty zipper, it should withstand dozens of cycles in your washer and dryer. Your Wash‘n Zip Pet Bed features multiple layers of fluffy cushion, so your pet will love how comfortable it feels. 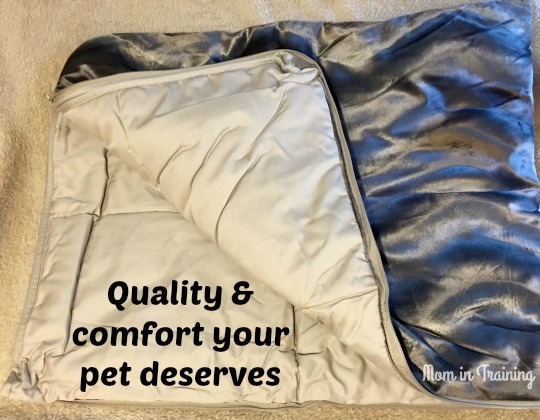 The top layer is made of a soft, plush material that your pet will find warm and cozy. The inside consists of sheets of polyester batting (many dog beds are stuffed with loose filling…that’s why they get lumpy when laundered) which is sewn into the seams and box-stitched which holds the interior padding in place. This keeps the Wash ‘n Zip from getting lumpy and disfigured, so your bed will keep its original shape over time. The quality zipper slides easily, so reassembling is fast and effortless. Because you can easily launder your entire Wash‘n Zip Pet Bed, it is absolutely THE cleanest pet bed on the market. Buy it: You can purchase the Wash'n Zip Pet Bed through their online store or through authorized retailers. BUY NOW & SAVE! Get 10% off using code JAVA through 11/26/16. The Wash'n Zip Pet Bed comes in a range of sizes from X-small up to X-Large so there's a size that would be perfect for your beloved pet. And if you're not sure what size to order they even have a page on their website with links to help with that too. Win it: One lucky reader will win a Wash'n Zip Pet Bed (choice of size/color). This giveaway will end November 8th at 11:59 PM EST. The winner will have 24 hours to respond to my email. If no response, a new winner will be chosen. Prize fulfillment will be made by the sponsor, I am not responsible for prize delivery or lost or stolen deliveries. Open to residents of the US. I am trying to win this for my YorkiePoo Sammi! I would love to win this for my pup Bronco, he is a Lab/German Shorthair Mix. Thanks so very much for the chance! I'm trying to win this for my Chihuahua/Boston terrier mix, Rosey. we have a mixed breed rescue that i would love to win this for. she loves to be pampered. My dog is a rescue. She's a Boxer/Pointer mix. I am trying to win this for my Chihuahua "Cujo". I'd like it for my medium sized dog, Helen. She's a Labrabull (Lab/Pit mix). Thanks. I am trying to win this bed for my large pit/lab mix. I have two furbabies that would love this! My Precious, a pug mix and my Little Boy, a chewy mix. My tollers would / do love these beds..
We have a few cats that love the beds we currently have but they are starting to fall apart. Would love to have this for my German Shepherd. My dogs are medium sized mixed breeds. I love this bed. I have a beagle. I would like to win a bed for my dog LaMancha he is a golden retriever. My mom's dog is a rescue dog that is a terrier mix. We have a half shitzhu and poodle....and he's just so cute! I would like to win this for my Dixie Doggy! She is am adorable, perfect Puggle! A mix of a German shepherd and a husky. We have two labs! Buddy and Bella! I have two very large cats, both like our bed very much, so I'd like to give them another option. I have a Shellie would would snuggle up in this. Decisions, decisions. We have 2 dogs - Roxi is half pug/half boston and Bella is half pit/half chocolate lab. I am trying to win this for our lab mix dog. I am try to win this for our cocker spaniel/poodle mix, Tiny T.
I have a mixed bread dog. She is a rescue dog so we are not sure exactly what she is. I have a medium pit-mix rescue. I also have a very large cat. They both like beds. Bo is a 70 lb. Boxer.He is a sweetheart.Loves to stand up and hug you. Our daughter has two Pomeranians who would love this nice bed. We have a black lab. I have a 14 week old Shi-Tzu named Jessie J. that I would love to win this for. I am trying to win for my Boston terrier Jack. I have a little yorkie!